Ganesha's most favoured fruits are kapitta ( Wood apple ), Jambu(Rose Apple ), Aamra phalam (Mangoes), Kadali phalam (bananas), Daadimi phalam ( pomoegranate) and Bahunetra phalam or Anaasa phalam ( pineapple). Ganesha is Beejapooraphalaasakta - The one who loves the fruit Citron (Narthampazham in Tamil and Heralekai in kannada ). 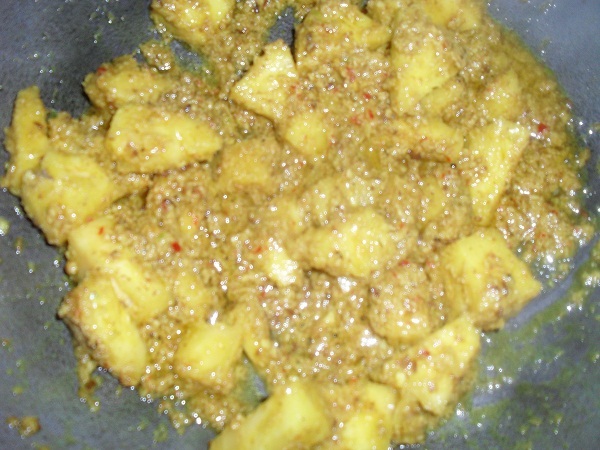 A delicious Kalanda Saadam / Chitraanna can be prepared using the juice of this fruit. But here is a rice dish prepared with another favourite fruit of Lord Ganesha - the pineapple fruit. 1. Wash and drain basmati rice and allow it to soak for half an hour. 2. Dry roast bengal gram dal, coriander seeds , cumin seeds and red chillies till you get a pleasant aroma. 3. 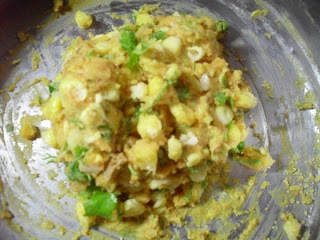 Grind the roasted ingredients with fresh coconut gratings and turmeric powder into a smooth paste adding little water. 4. Peel and chop pineapple and its core into cubes. 6. When the mustard seeds splutter add pineapple and the ground paste and saute for a couple of minutes. 7. 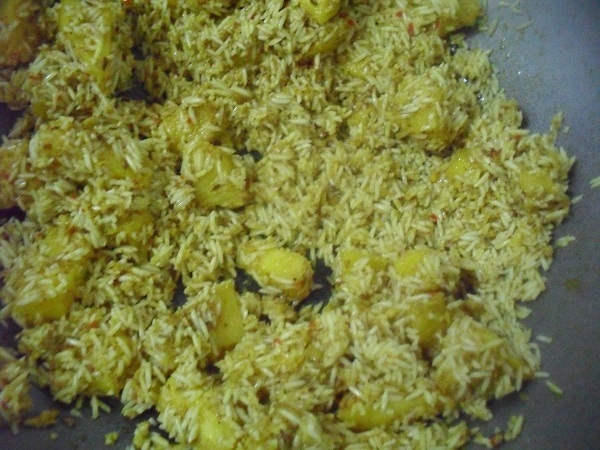 Add the soaked rice and fry, coating the rice with the paste till it starts sticking to the kadai. 8. 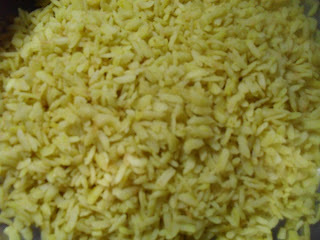 Add salt, jaggery and two cups of water to the fried rice. 9. When it starts boiling, stir well , cover and cook on low flame for ten minutes. 10. Open the lid, stir once more and replace the lid. 11. Cook for another ten minutes until all the water is absorbed or the Anaasa Annam is done and sprinkle the chopped fresh coriander leaves. Fry cashew nuts and raisins in ghee and garnish the Anaasa Annam before offering it to Sri Ganesha. Enjoy the flavoursome prasaadam. Ganesha is Lambodara - the pot bellied one. Apart from the hundreds of sweets and savouries offered to Him by His devotees, the Chubby Baby loves fruits, vegetables, roots and tubers too.Sweet potato and Tapioca are supposed to be His favourite root vegetables. 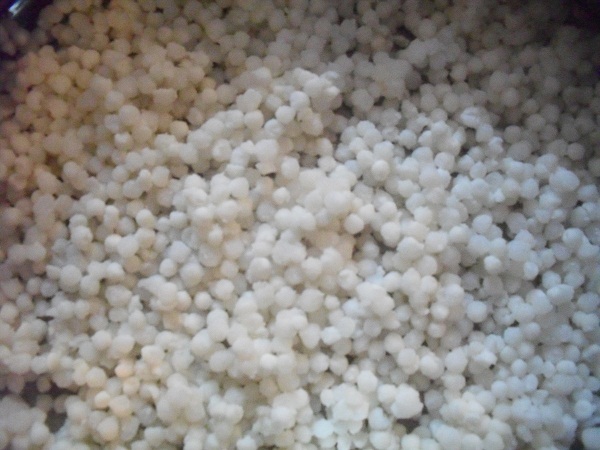 Jevvarisi / Sago is manufactured using the tapioca root. 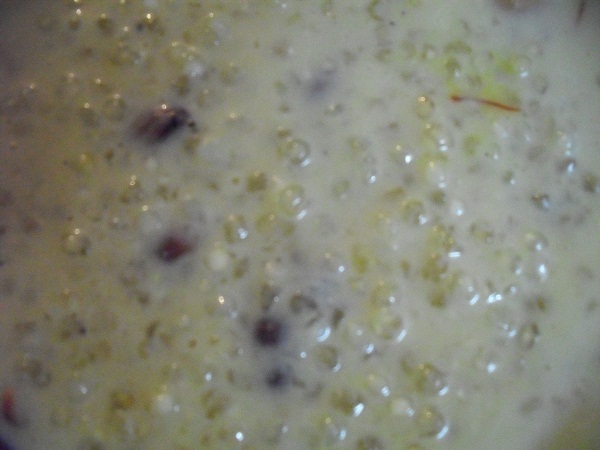 Ganesha will be most pleased with the sweet Jevvarisi Paayasam prepared out of His favourite tapioca. 1. Dry roast the sago till it pops up. 2. Wash the roasted sago and drain the water. 3.Cover it with a lid and allow it to soften for about half an hour. 4. 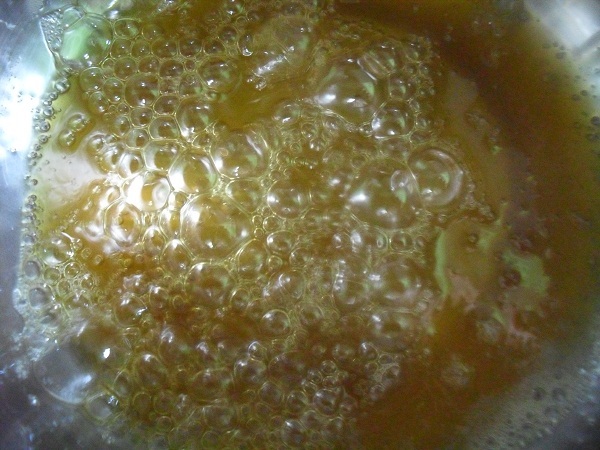 Dissolve jaggery in 2 1/2 cups of water and filter. 5. 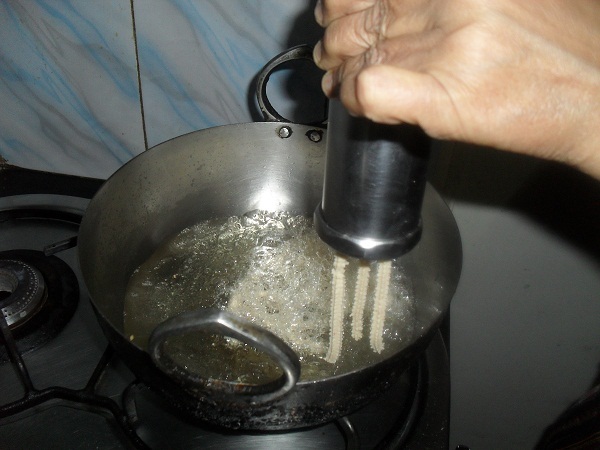 Boil the jaggery water till it emanates a very pleasant aroma. 6. 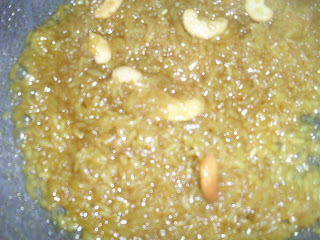 Add the softened sago to the jaggery water and cook till it thickens. 7. 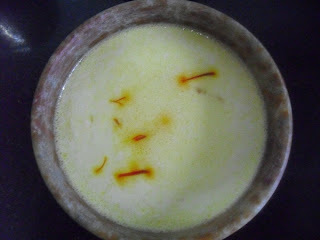 Add saffron strands, powdered cardamom and camphor and switch off flame. 8. Stir in the milk / coconut milk. 9. 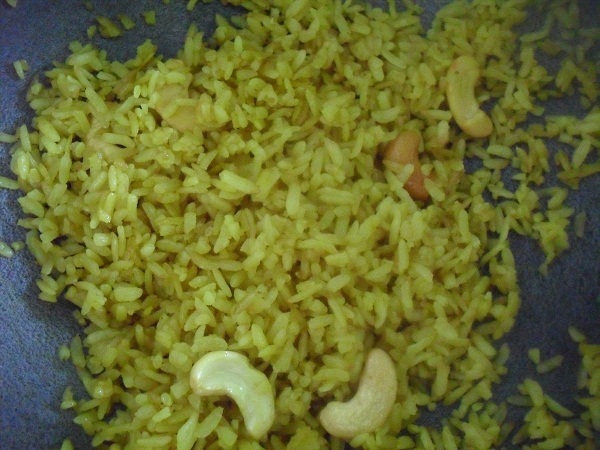 Heat ghee and fry the cashew nuts and raisins till golden in colour and add it to the paayasam. Allow the paayasam to set in a bowl or in small individual bowls. Offer the thick Jevvarisi Paayasam to Lord Ganesha and enjoy the prasaadam. Aama vadai or Vadai prepared using bengal gram dal is a standard dish required to celebrate all the festivals in South Indian homes.With the addition of onion and some spices it can be turned out into a delicious Masal Vadae - a spicy snack. 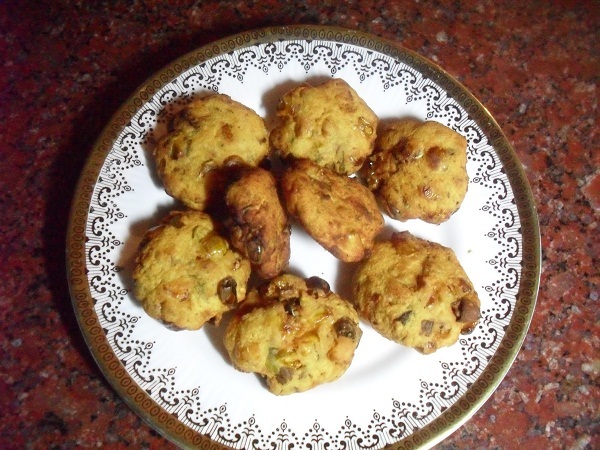 Vadai occupies an important place among the prasaadams prepared for Sri Ganesha Chaturti as well. Lord Ganesha is referred to as Dantin (The one who has tusks ) in the ancient sacred texts. Dantin is described as holding a corn sheaf in one hand and a sugar cane in the other. He is the protector of crops and His rat mount symbolises that He controls pests and assures of a bountiful harvest. 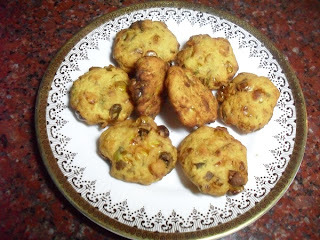 Here is a Vadai for Sri Ganesha prepared with His favourite corn - Sholam - which He holds in His hand. 1. Defrost the corn and squeeze out the excess water. 2. Mix all the ingredients together adding 1 tbsp of hot oil. 3. Sprinkle water little at a time and knead it into a stiff dough. 4. Mix in the remaining 1 tbsp of oil so that the dough does not stick to your hand. 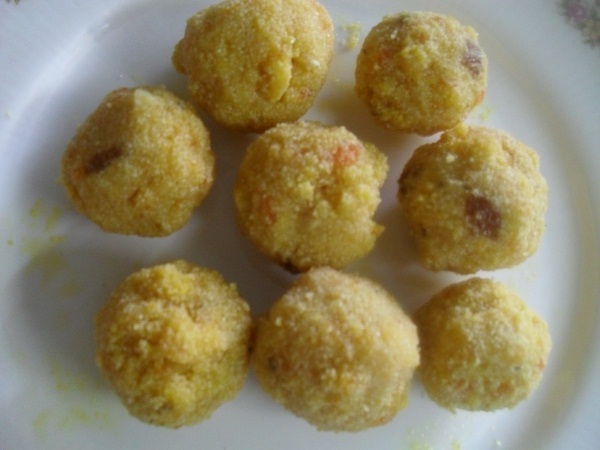 6.Pinch a small lemon size ball of dough and pat it into a round vadai on your wet palm. 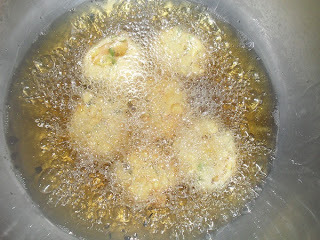 7.Slide the vadai into hot oil. 8. 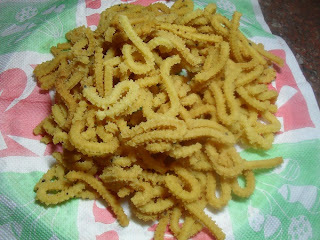 Make batches of 6 or 8 vadais and fry on medium flame until they turn golden brown in colour. Offer the hot and crisp Shola Vadais with soft interiors to Lord Ganesha and relish the Ganesha Prasaadam. Lord Ganesha is Vigna Vinaashaka ( destroyer of hurdles ). 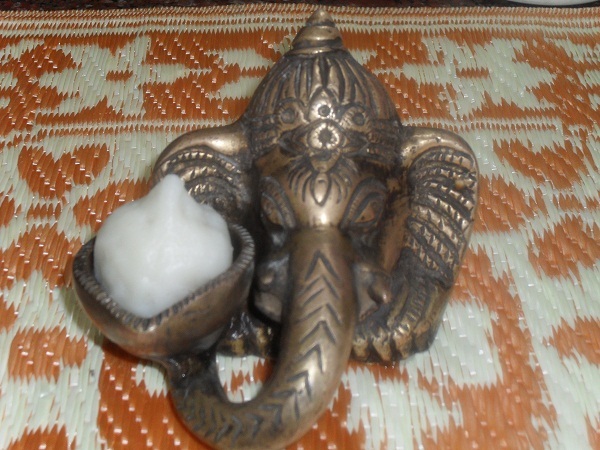 The elephant faced Child with elephantine strength to match, destroys all the obstacles encountered by His devotees.A nourishing Sundal is an apt prasaadam which can be offered to the Lord on Ganesha Chturti day. 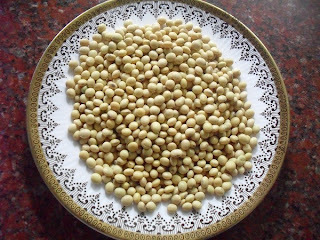 Mostly Kadalai (Chickpea) Sundal prasaadam is distributed in leaf cups / paper cups in all the pendaals which mushroom through out the city to celebrate the festival of Lord Ganesha. 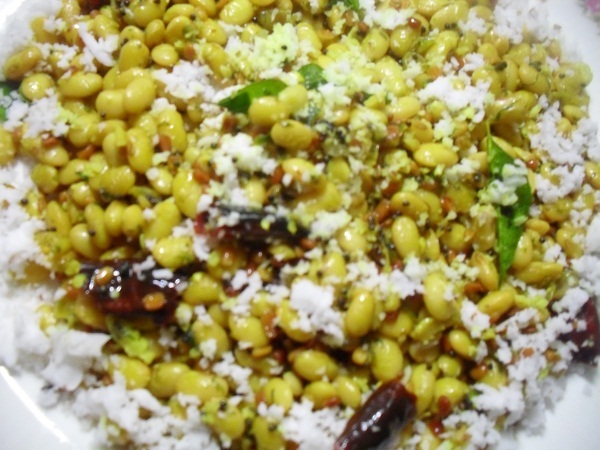 Here is a recipe for a very healthy and nutritious Soya Sundal which can be offered to Lord Ganesha. 1. 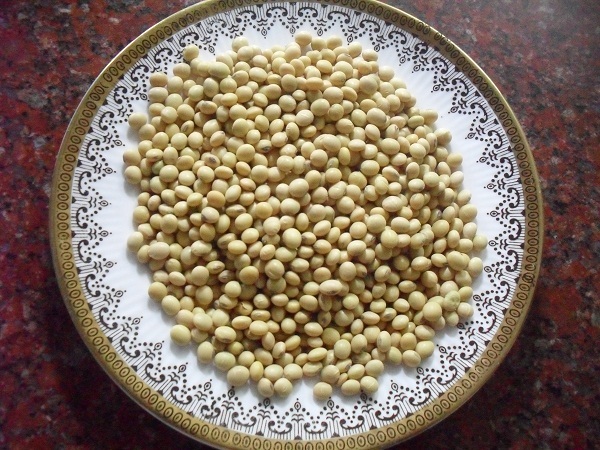 Soak soya beans for 24 hours changing the water at least twice during the soaking time. 2. 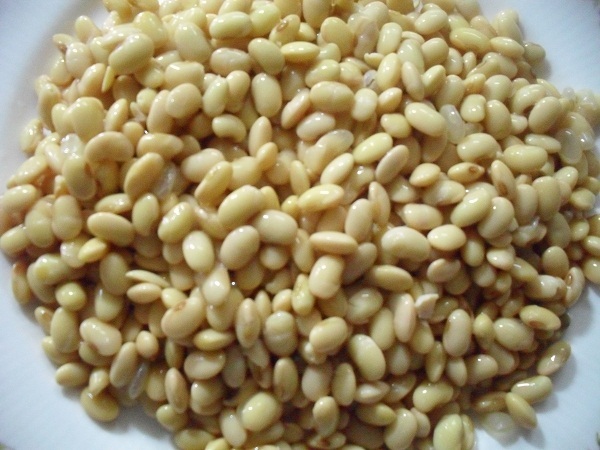 Wash the soya beans, add 1/2 cup of water and cook in a pressure cooker until three whistles. 3. Grind green chillies, ginger, turmeric powder and coriander leaves into a paste adding little water if necessary. 4. Heat oil and add mustard seeds. 5.When the mustard splutters add the split black gram dal. 6. 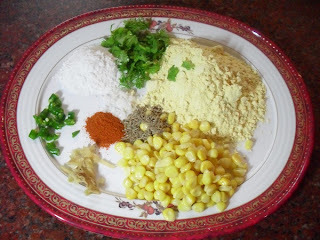 When the dals turns golden in colour add broken red chillies and asafoetida. 7. Add the ground paste and saute till you get a pleasant aroma. 8. Drain the cooked beans and add it to the seasoning. 9. Add salt and cook till the sundal becomes dry. 10. Squeeze in lime juice and switch off flame. 11. Mix well and garnish with fresh coconut gratings. 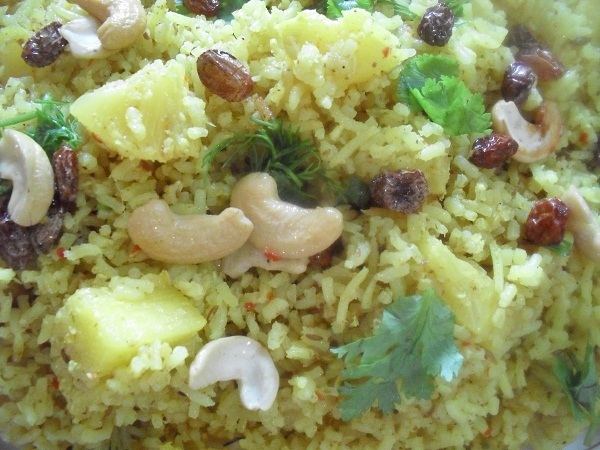 Offer the nutritious Soya Sundal to Lord Ganesha and savour the prasaadam. Lord Ganesha's happy face - Prasanna Vadanam - looks radiant with grace when His devotees offer Him His favourite Kohukattai / Modakam. 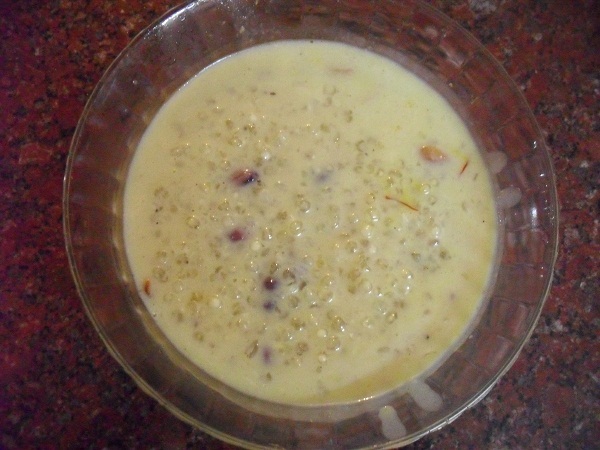 Kozhukattai is the first and foremost among the various other sweets prepared on Ganesha Chaturti day. 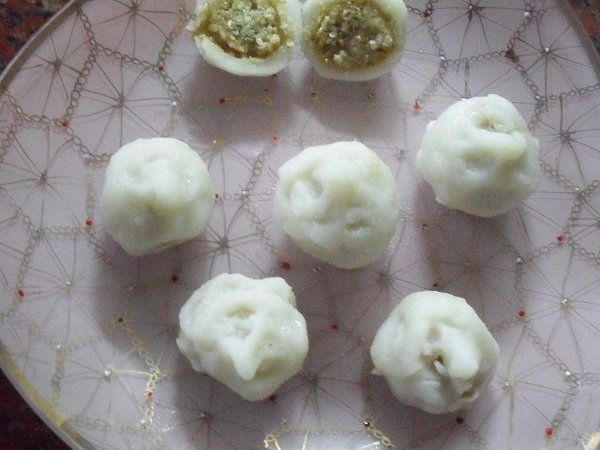 Tengai poorna kozhukattai ( a dumpling with coconut and jaggery filling ) is the traditional sweet prepared for Ganesha Chaturti. Some times Ellu Poorna kozhukattai ( dumpling with sesame and jaggery filling ) is also prepared for variety. The method of preparing both the kozhukattais are the same except that the fillings are different. 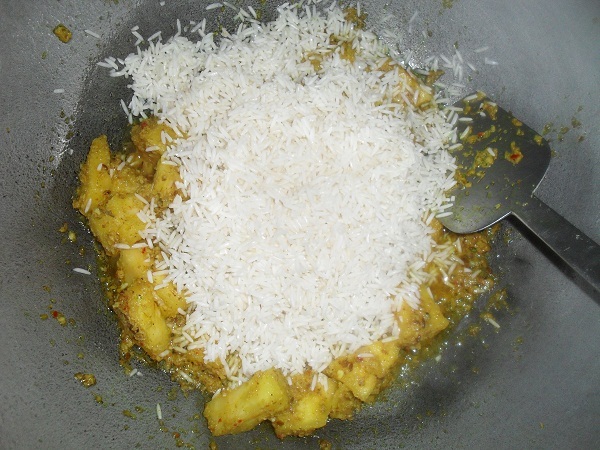 The dough for the outer covering of the kozhukattais are usually prepared by cooking the rice flour in water. 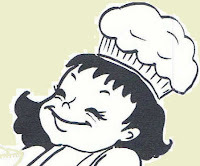 Portions of the dough are shaped into cups, stuffed with the sweet filling, sealed and then steamed. Here is another method where the raw rice flour is only mixed with water to make the dough. Portions of the dough are flattened on the palm and filled with the poornam ( Sweet filling ) and sealed. 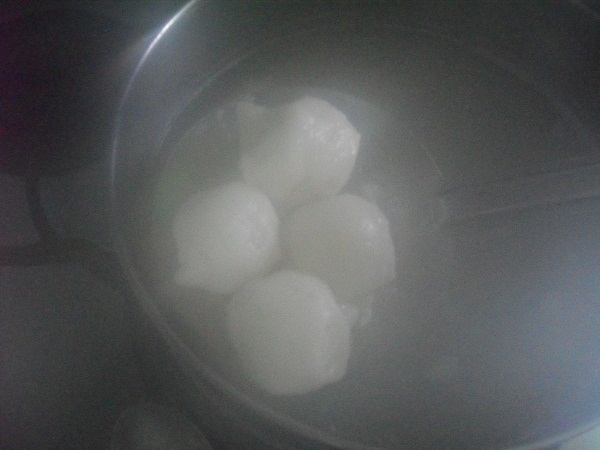 Then the raw kozhukattais are directly cooked in boiling water. 1. Dry roast sesame seeds till you get a pleasant aroma. 2. 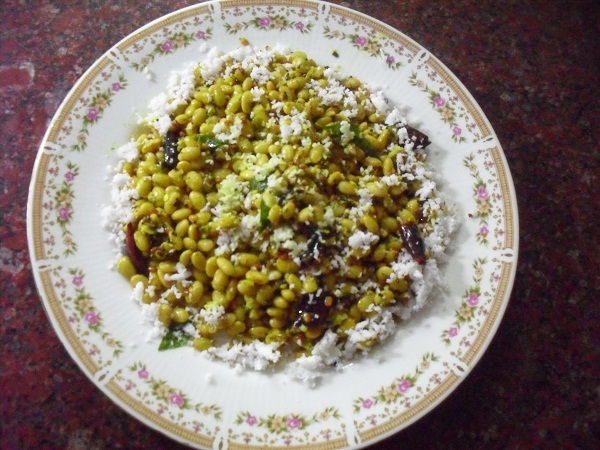 Cool the roasted seeds and grind with dry coconut gratings and jaggery into a slightly coarse powder. 3. 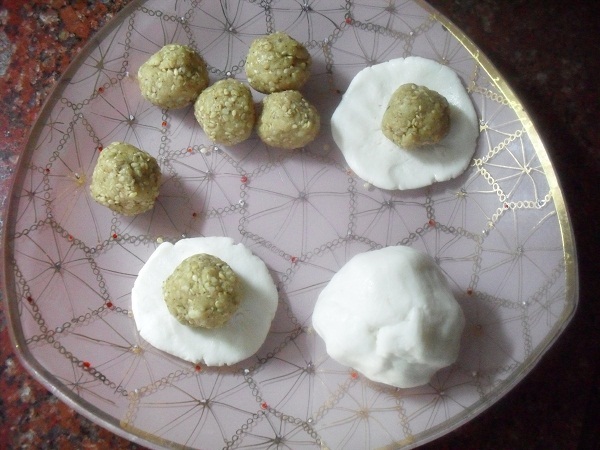 Make plum size balls out of the ellu poornam .The oil in the sesame seeds and the sticky jaggery will enable the balls to hold. 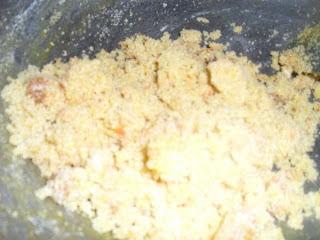 4.Mix rice flour, salt and oil in a bowl and make a soft dough adding water little by little. 5. 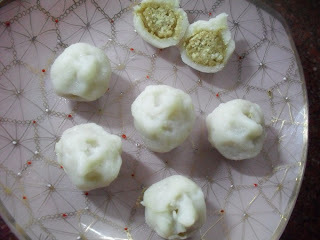 Pinch a small lemon size ball from the dough, flatten it on your palm and place a ball of poornam in the middle. 6. Gather the edges together and seal the poornam with a peak. 7. Set a wide mouthed vessel with 1/2 lit of water adding 1/2 tsp of sesame oil on the stove and switch on the flame. 8. In the mean while make a batch of 6 , 8 or 10 kozhukattais depending on the size of the cooking vessel. 9. Gently drop the kozhukattais one by one into the boiling water. 10. Boil for 5 minutes . Use a spoon and slightly prod the kozhukattais so that they do not 'sit' at the base of the vessel for long. 10. Cook for 5 more minutes till the cooked kozhukattais start floating up. 11. 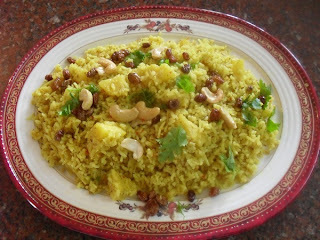 Remove the kozhukattais gently using a perforated ladle and drain them. Offer the delicious Ellu Poorna Kozhukattais to Lord Ganesha and enjoy the prasaadam along with His blessings. After a lot of persuasion by Sri Krishna, the Lord's childhood friend Kuchela hands out his humble offering to Him. The beaten rice offering conveys to the Lord the predicament of his dear friend Kuchela who is pounded and beaten by the worldly miseries. 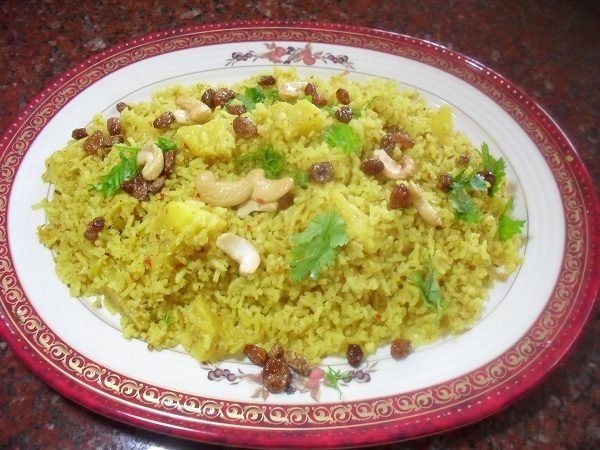 When Krishna lovingly savours the beaten rice Kuchela is blessed with all the sweetness in life. Offering Vella Aval to Sri Krishna reminds us that He stands by his devotees in all the ups and downs of life. 1. 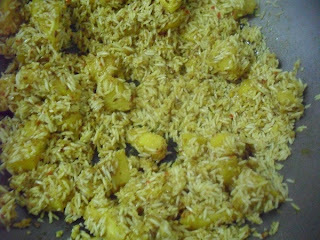 Dry roast beaten rice till it pops up and gives out a pleasant aroma. 2. Wash the roasted aval and squeeze out all the water. 3. Rub salt and turmeric powder evenly, cover with a lid and allow to soak for fifteen minutes till it becomes soft. 4. 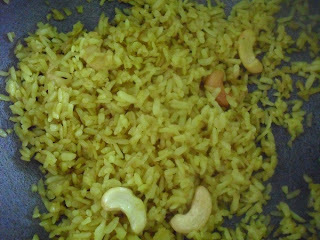 Heat one spoon of ghee in a pan and fry the cashew nuts to a golden colour. 5. Add the soaked aval and stir well. 6. Cover and cook on low flame for a few minutes. 7. Remove lid and stir well and switch off flame when all the moisture is evaporated. 8. Add one cup of water to crushed jaggery and boil it in another saucepan. 9. Filter the jaggery water, return it to the saucepan and continue boiling till the syrup foams and becomes very sticky. 10. 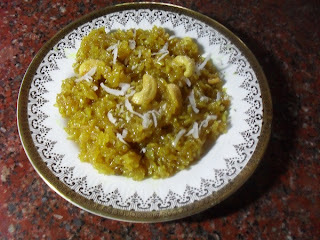 Add the jaggery syrup to the aval and stir well. 11. Switch on the stove and cook the aval in jaggery syrup till the syrup coats each and every grain of aval. 12. When the vella aval becomes dry switch off flame again. 13. Add cardamom powder and the dry coconut gratings. 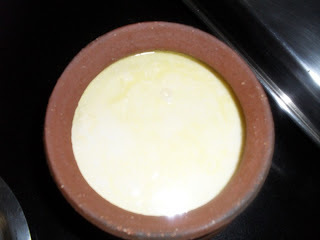 14.Add the remaining ghee and allow the vella aval to cool. 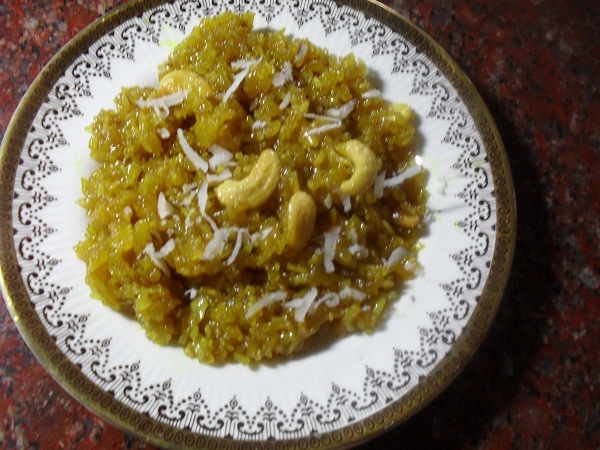 Fluff up the jaggery coated Vella Aval using a spoon or fork and offer it to Sri Krishna.Savour the prasaadam and enjoy the bliss. Baby Krishna's heart is like a ball of butter. It melts for his devotees. The devotees know no greater joy than feeding the divine baby a pot of freshly set curd. 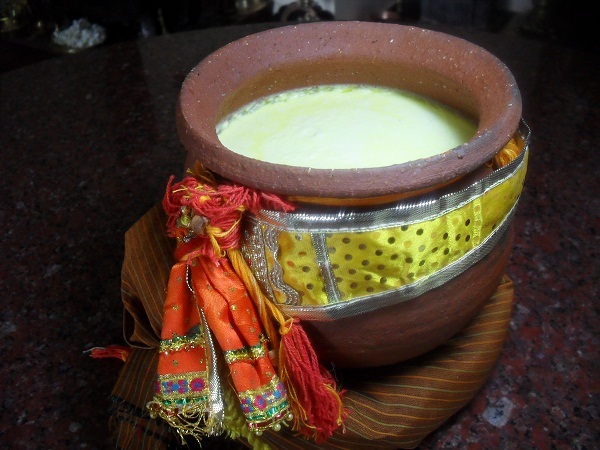 Here is a method to set a fresh and thick shatti thair ( curd set in a clay pot ) to celebrate the birthday of the very special Baby. 1. 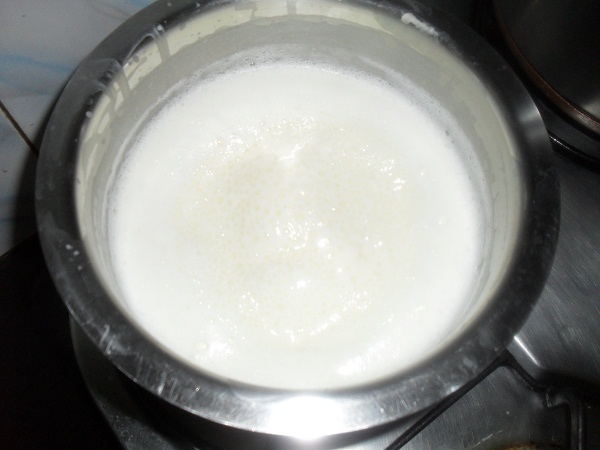 Boil whole milk in a big vessel so that the milk does not over flow. 2. Keep stirring now and then and boil the milk for at least 5 minutes and then switch off flame. 3. Wash the clay pot thoroughly and fill it up with hot water. 4. Allow the milk to cool down until it becomes lukewarm or a little more warm if the day is cold. 5. 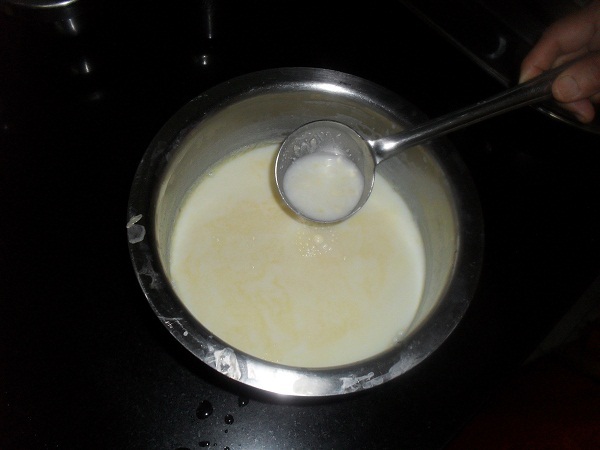 Take a teaspoon of curd in a ladle and stir it into the warm milk. 6. Stir vigoursly till the culture blends well with the milk. 7. 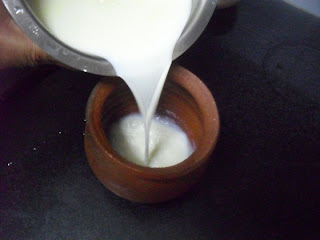 Empty out the hot water from the clay pot and pour the milk gently into the warm pot. 8. Cover with a lid and leave it near the stove over night. 9. Early next morning gently move the pot into the refrigerator. Fresh thick Shatti Thair is ready for the evening pooja. 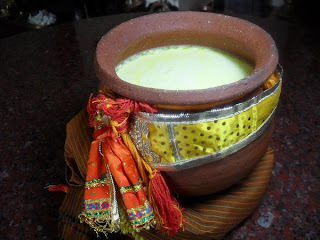 1.Add a few strands of saffron to the hot milk as soon as you switch off flame. 2. 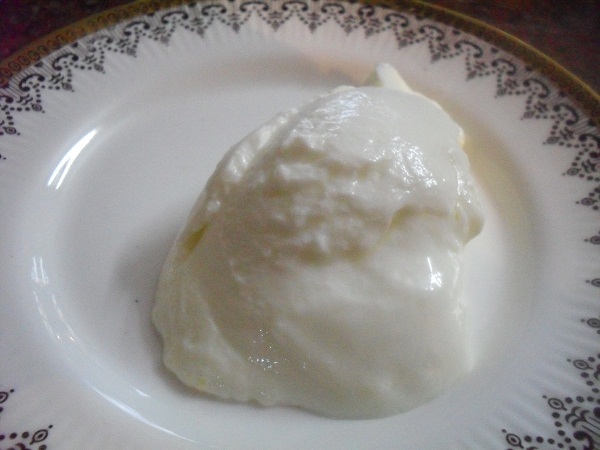 When it becomes lukewarm introduce the curd culture as said before. 3. Pour the milk into individual katories ( bowls ) and cover each bowl with a small lid. 4. Leave them near the stove to set overnight. 5. Refrigerate in the morning. 6. Top the special curd in each bowl with pistachios and a sprinkle of sugar just before offering it to Baby Krishna. 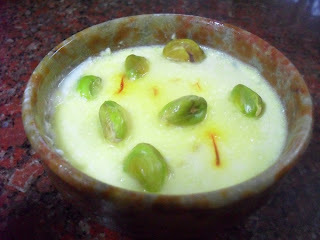 Enjoy the Special Curd prasaadam with family and friends. 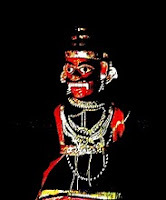 This is an easy to prepare 'murukku' and can be turned out instantaneously. It is a 'melt in the mouth' snack , as Baby Krishna's favourite 'bennae' (butter ) is used in preparing the dough. 1. Grind the roasted gram into a fine powder and just take one cup of flour for the murukku. 2. Combine rice flour, roasted gram flour, salt, chilly powder, asafoetida and sesame seeds in a bowl. 3. Rub in the butter thoroughly into the flour mixture. 4. Add water little by little and prepare a soft dough. 5. 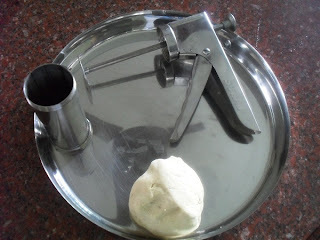 Grease the mould of the murukku press and fill it with one portion of the prepared dough. 6.Heat the oil for frying. 7. Press the dough directly into the hot oil . 8. 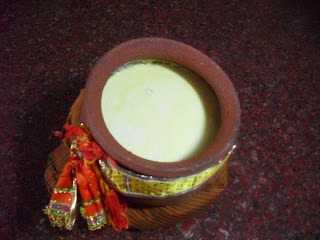 Decrease flame to medium and flip the murukkus gently. 9.Cook until the oil stops sizzling and the murukkus turn golden brown in colour. 10. 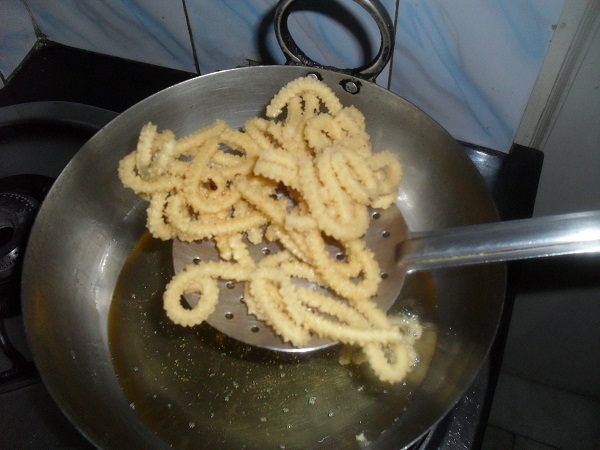 Remove the Bennae Murukkus using a perforated ladle and drain them on a paper towel. Increase flame and press the next batch. Regulate heat as and when needed. 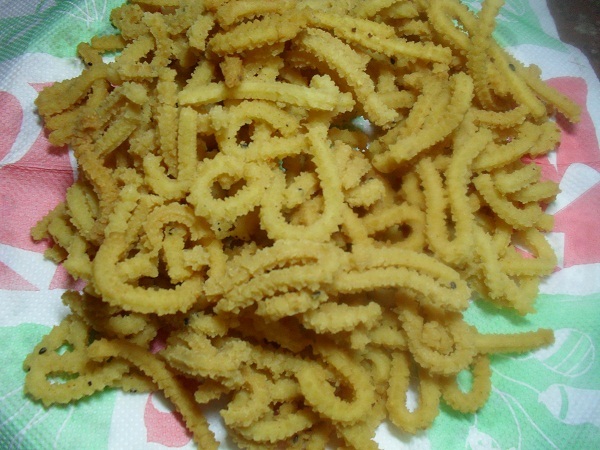 Offer the crunchy Bennae Murukku to Sri Krishna and share the addictive prasaadam with family and friends. Children like all types of laddus. It is easy for them to hold the laddus in their tiny cupped palms and relish the sweet bite by bite. 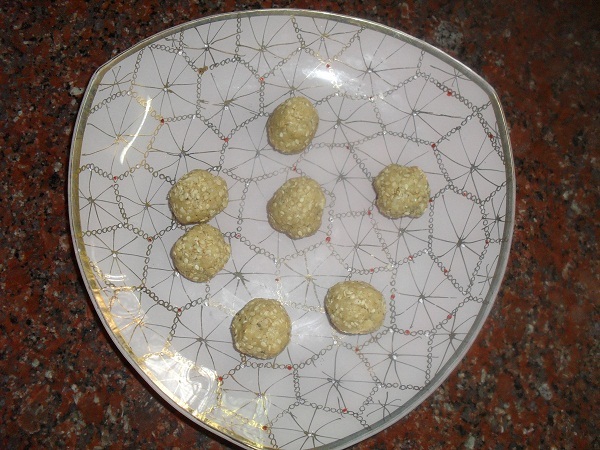 Rawa laddu is a traditional sweet prepared in all South Indian homes. 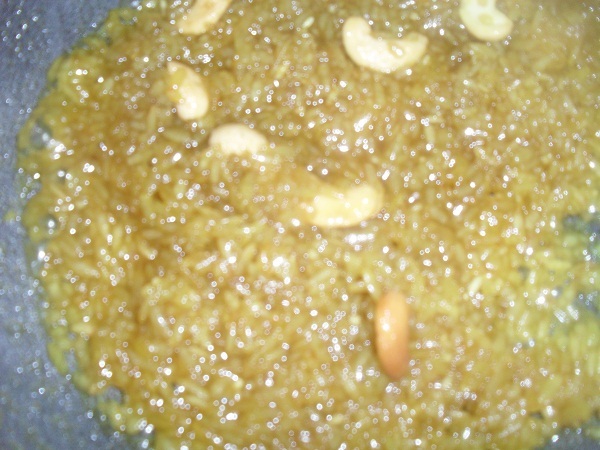 Carrot Rawa Laddus are slightly different from the traditional ones. 1, Peel, dice and grind carrots with little water into a coarse paste. 2. Add water if necessary to make one cup and keep aside. 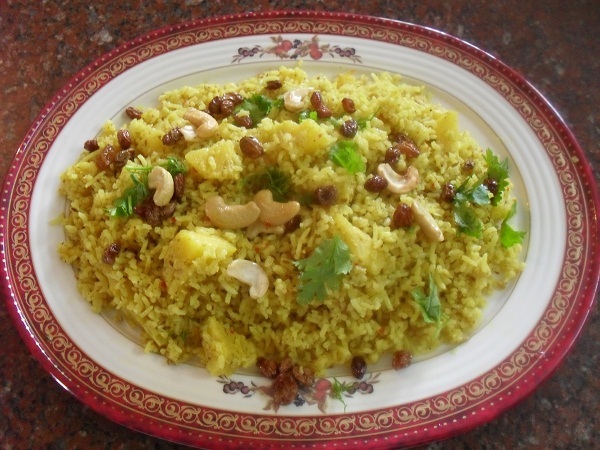 3.Heat ghee in a heavy bottomed pan and fry the cashew nuts and raisins till they become golden in colour. 4.Add rawa and continue to roast till it gives out a pleasant aroma. 5. Remove the roasted ingredients to a plate. 6. 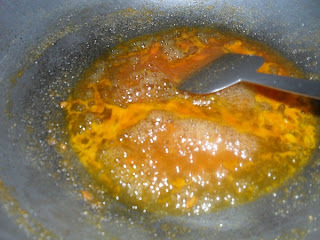 Add the carrot paste and sugar to the same pan and cook till it reaches the soft ball stage. 7. When the carrot syrup is sticky enough to bind the rawa, add the fried rawa and mix well. 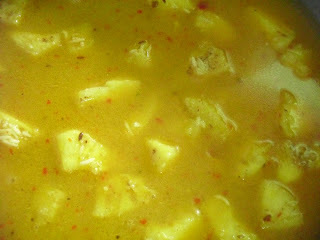 8.Add cardamom powder, switch off flame and allow it to cool for a few minutes. 9. Grease your palm with little ghee, sprinkle a teaspoon of warm milk to a small portion of the crumbly mixture and make a laddu. 10 . Continue sprinkling warm milk and make the laddus portion by portion while the mixture is still warm. 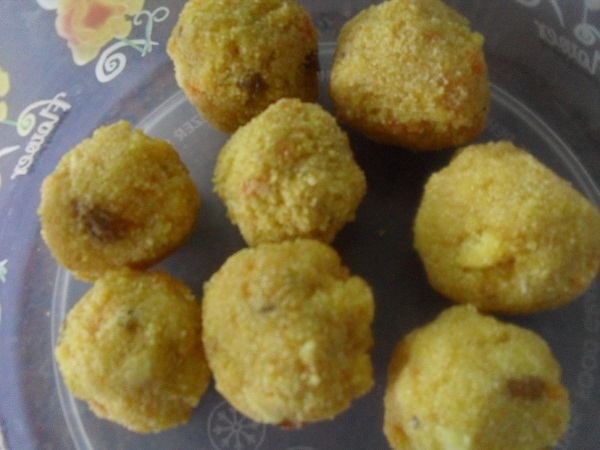 Offer the Carrot Rawa Laddu to baby Krishna on His happy birthday and distribute the prasaadam to all the children.